Questions or interested in learning more about Scholarship Management Resources? Call Brett Fields at 614-469-0629 or click the button below. Thanks for your interest in Scholarship Management Resources. We will be in contact soon! SMR is a service of OFIC, a non-profit leader in higher education scholarship solutions. “Nordson Corporation selected SMR because of their over three decades of experience in scholarship management and their attention to our organization’s needs. We wanted to diversify our intern pool and by working with SMR we achieved that goal. Our recent pool of SMR-selected Nordson BUILDS Scholars includes 47% women and 46% students of color. Through this program, SMR is helping Nordson drive talent to our company and industry. Scholarship programs provide essential financial support for today's college students at a time when a college degree is required for more workforce positions but obtaining a degree depends heavily on financial means. Managing a scholarship program, however, is complex and time-consuming. It requires creating and maintaining a network of high school and college contacts; tracking applications; working with selection committees; distributing funds; monitoring academic performance and continuing financial need; and reporting to the provider. Let us do the work! Allows you to be involved in the scholarship process as much or as little as desired. Our selection committee ensures scholarship awards are unbiased and fair. 30 years in scholarship management. Nearly 70 years in fundraising for higher education. Streamlined processes resulting in time and resource savings for you. Scholarship Management Resources (SMR) provides a service for clients to outsource the management of their scholarship programs to an experienced team with an established network of higher education contacts and a record of success. SMR efficiently and cost-effectively facilitates a range of programs for its clients, corporations, trust officers, foundations, service or affiliation organizations, and individuals. Develop policies, procedures and timelines for new scholarship programs. Assist in marketing and promoting the scholarship program to the target population in specific high schools or colleges, churches, service clubs, corporate offices, etc. Create and maintain a web-based application. Identify outstanding scholarship candidates and select scholars. Verify with client that scholars meet scholarship criteria. Notify scholars and colleges/universities of awards. Distribute funds to scholars' colleges/universities. Work with financial aid offices to verify appropriate use of funds and avoid violation of NCAA regulations. Monitor student success, ongoing eligibility, and financial need. Provide status reports and thank you letters from scholars. Corporate clients often choose to fund scholarships for students from their communities or create a scholarship program for children of employees. 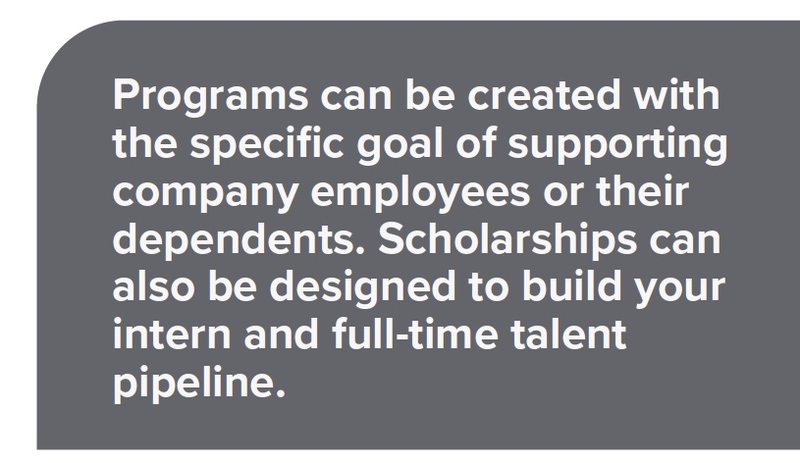 Employee scholarship programs have a significant positive impact on corporate loyalty and employee retention. As the human capital crunch escalates, more corporations are expected to turn to scholarship programs as an effective way to retain a talented workforce. Additionally, outsourcing the corporate scholarship program helps to avoid issues of perceived favoritism by putting scholar selection in the hands of experienced people who will match scholars with your strategic goals. Learn how Nordson Corporation partnered with OFIC to give back to their community and shape their workforce through the Nordson BUILDS scholarship program.